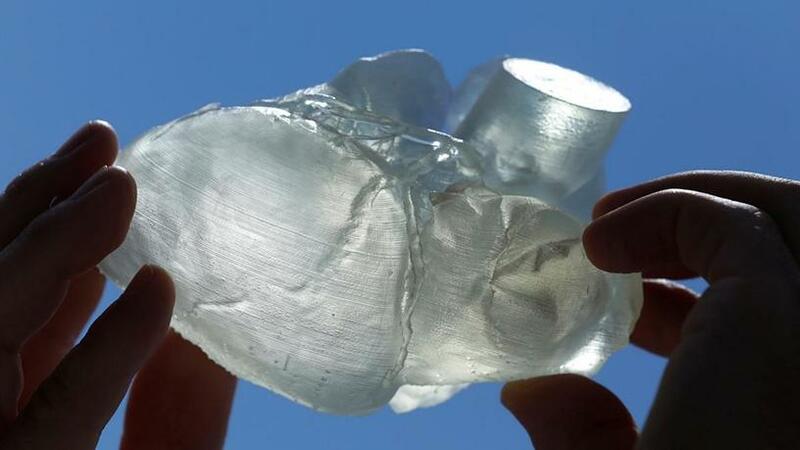 A three-dimensional printout of a human heart. Armed with a mouse and computer screen instead of a scalpel and operating theatre, cardiologist Benjamin Meder carefully places the electrodes of a pacemaker in a beating, digital heart. Using this "digital twin" that mimics the electrical and physical properties of the cells in patient 7497's heart, Meder runs simulations to see if the pacemaker can keep the congestive heart failure sufferer alive, before he has inserted a knife. The digital heart twin developed by Siemens Healthineers is one example of how medical device makers are using artificial intelligence (AI) to help doctors make more precise diagnoses as medicine enters an increasingly personalised age. The challenge for Siemens Healthineers and rivals such as Philips and GE Healthcare is to keep an edge over tech giants from Alphabet's Google to Alibaba that hope to use big data to grab a slice of healthcare spending. With healthcare budgets under increasing pressure, AI tools such as the digital heart twin could save tens of thousands of dollars by predicting outcomes and avoiding unnecessary surgery. A shortage of doctors in countries such as China is also spurring demand for new AI tools to analyse medical images and the race is on to commercialise products that could shake up healthcare systems around the world. While AI has been used in medical technology for decades, the availability of vast amounts data, lower computing costs and more sophisticated algorithms mean revenues from AI tools are expected to soar to $6.7 billion by 2021 from $811 million in 2015, according to a study by research firm Frost & Sullivan. The size of the global medical imaging analytics software market is also expected to jump to $4.3 billion by 2025 from $2.4 billion in 2016, said data portal Statista. "What started as an evolution is accelerating towards more of a revolution," said Thomas Rudolph who leads McKinsey & Company's pharma and medical technology practice in Germany. For Siemens Healthineers and its traditional rivals, making the transition from being mainly hardware companies to medical software pioneers is seen as crucial in a field becoming increasingly crowded with new entrants. Google has developed a raft of AI tools, including algorithms that can analyse medical images to diagnose eye disease, or sift through digital records to predict the likelihood of death. Alibaba, meanwhile, hopes to use its cloud and data systems to tackle a shortage of medical specialists in China. It is working on AI-assisted diagnosis tools to help analyse images such as CT scans and MRIs. Siemens Healthineers, which was spun off from German parent Siemens in March, has outpaced the market in recent quarters with sales of medical imaging equipment thanks to a slew of new products. But analysts say the German firm, Dutch company Philips and GE Healthcare, a subsidiary of General Electric, will all come under pressure to prove they can save healthcare systems money as spending becomes more linked to patient outcomes and as hospitals rely on bulk purchasing to push for discounts. Siemens Healthineers has a long history in the industry. It made the first industrially manufactured X-ray machines in 1896 and is now the world's biggest maker of medical imaging equipment. Now, chief executive Bernd Montag's ambition is to transform it into the "GPS of healthcare"; a company that harnesses its data to sell intelligent services, as well as letting smaller tech firms develop apps feeding off its database. As it adapts, Siemens Healthineers has invested heavily in IT. It employs 2 900 software engineers and has over 600 patents and patent applications in machine learning. It is not alone. Philips says about 60% of its research and development (R&D) staff and spending is focused on software and data science. The company said it employs thousands of software engineers, without being specific. Experts say the success of AI in medical technology will hinge on access to reliable data, not only to create models for diagnosis but also to predict how effective treatments will be for a specific patient in the days and years to come. "Imagine that in the future, we have a patient with all their organ functions, all their cellular functions, and we are able to simulate this complexity," said Meder, a cardiologist at Heidelberg University Hospital in Germany who is testing Siemens Healthineers' digital heart software. "We would be able to predict weeks or months in advance which patients will get ill, how a particular patient will react to a certain therapy, which patients will benefit the most. That could revolutionise medicine." To this end, Siemens Healthineers has built up a vast database of more than 250 million annotated images, reports and operational data on which to train its new algorithms. In the example of the digital twin, the AI system was trained to weave together data about the electrical and physical properties and the structure of a heart into a 3D image. One of the main challenges was hiding the complexity and creating an interface that is easy to use, said Tommaso Mansi, a senior R&D director at Siemens Healthineers who developed the software. To test the technology, Meder's team created 100 digital heart twins of patients being treated for heart failure in a six-year trial. The computer makes predictions based on the digital twin and they are then compared with actual outcomes. His team hopes to finish evaluating the predictions by the end of 2018. If the results are promising, the system will be tested in a larger, multi-centre trial as the next step to getting the software approved by regulators for commercial use. Siemens Healthineers declined to say when the technology might eventually be used by clinics or give details on how its digital heart, or models of other organs it is developing such as the lungs and liver, could be monetised. Both GE and Philips are also working on versions of digital heart twins while non-traditional players have been active too. Drawing on its experience of making digital twins to test bridges and machinery, French software firm Dassault Systemes launched the first commercial "Living Heart" model in May 2015, though it is only currently available for research. Philips sells AI-enabled heart models that can, for example, turn 2D ultrasound images into data that helps doctors diagnose problems, or automatically analyse scans to help surgeons plan operations. Its vision, like Siemens Healthineers, is to add more complexity to its existing heart models by pulling together scans, ECGs and medical records to create a model that can predict how a heart will respond to therapy in real life. For now, such software is still in the early stages of development and companies will have to work with regulators to thrash out how predictive models can be approved before doctors are willing to trust a diagnosis generated by a machine. Access to high-quality data with enough variation will be crucial, as will be the ability to interpret that data and turn it into something medical professionals can use, say experts. In particular, models will have to be trained on rare cases as they get closer to perfection, said Vivek Bhatt, chief technology officer at GE Healthcare's clinical care solutions division. "It's going to be extremely critical to have an ongoing process for getting more data, getting the right kind of data and getting data with those unique cases," he said. The established medtech players say their long-running relationships with hospitals and research institutes and vast networks of installed machines will give them an edge over new tech entrants. Siemens Healthineers, GE Healthcare and Philips say their databases are fed with a mixture of publicly-available data, data from clinical trials or from collaborations with hospitals, as well as some data from customers. All the data is made anonymous and only used with patients' consent, they say. Still, some campaigners and academics worry about patients' data being used primarily by companies as a commercial tool. Boris Bogdan, MD of at Accenture's life science practice in Switzerland, believes the ownership of data is a grey zone that could lead to a patient backlash if companies start making fortunes from it. "When Facebook started nobody really cared who owned the information," he said. "Now that people understand that Facebook earns tremendous money with their data, questions like data privacy, data usage and data monetisation are becoming more visible."